The Quark and Qubit crypto algorithms continue to be quite profitable, but until recently these algorithms were mostly in the Nvidia domain as the ccMiner for Nvidia GPUs was faster than the available performance on AMD hardware. 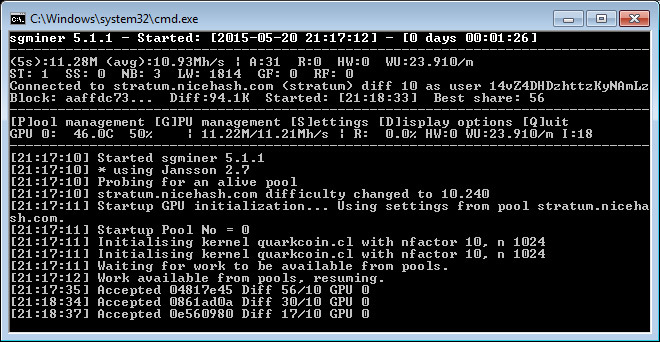 There is however a new sgminer fork with compiled Quark and Qubit kernels that was sent to us that brings up the hashrate significantly on Pitcairn and Tahiti AMD GPUs. 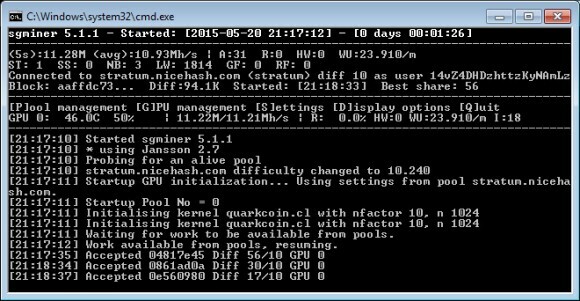 We have tested this particular sgminer on a Radeon R9 280X and we are getting about 11.22 MHS on Quark with a non overclocked GPU and about 12.3 MHS on Qubit and you can get higher with OC and increase in the Intensity. Quark is apparently quite profitable at the moment on NiceHash and WestHash due to the interest in SharkCoin or so it seems, so if you have some idle AMD GPUs that you are wondering where to point them there. Do note that the sgminer is not compiled by us and it comes with the standard OpenCL kernel files, so you need to use the binaries for the higher performance. Since we have not compiled this sgminer from source and it was sent to us already compiled we would recommend to be cautions and not run it on systems with wallets installed, just in case!